The Heir of Night was reviewed by me for the 2012 David Gemmell Morningstar Award, which went on to win the award! I've been aware of the novel for some time now but as it was never sent to me it remained one I'd been meaning to buy and I'm very glad that I'm getting the chance to read it for the Gemmell Awards. The Heir of Night follows the path of young Malian, heir to the throne of Night and being trained to rule her people garrisoned in the mountain range known as the Wall of Night. This "Keep of Winds" holds back the tide of shadow from the rest of the world and legend says that should Night fall, all will fall. The feared shadow launch an attack against the keep and women, children and preists are slain by dark creatures of twisted magic with chaos reigning through-out the castle. Malian flees into an adjacent old and largely forgotten keep but danger follows her path, causing her own latent magical power to spring into life. This previously untapped potential is a two-edged sword though and if she accepts its power, she must prepare to pay the price. The Heir of Night does a very effective job of building a rich and detailed fantasy world along with a very well developed magic system. I loved the dark, dangerous (almost brutal) bleak feel to the world - which reminded me a little of Robin Hobb's series of novels and there is a unique voice that projects with confidence from the pages of the book. There is a deep and very effective mythology to the whole novel and one that lives and breathes through ancient magic, prophecy and long forgotten heroes & villains. The plot isn't going to win any awards for originality but it is a very good example of the high fantasy genre and the author's descriptive narrative and confident, almost poetic writing style really do more than make up for treading a path already trodden. As a result the prose is actually quite refreshing and neatly avoids the trap of the myraid stereotypical, "tired" traditional fantasy stories that swamp the genre. The only weak point in the novel is the characterisation, while the main characters of Malain and Kalan are well drawn (if appearing a little naive at times, even for their age) some of the surrounding cast do feel a little flat. I can understand the intent of the author is to keep some of these people shaded in grey but at times this comes across as aloof rather than enigmatic. Having said that the author is confident enough to sacrifice people where it's required and for me this did add massively to the appeal. The other advantage of this subtle characterisation is an under-current that encourages a feeling of miss-trust in these people, each seeming to have their own agenda and personal goals which does work very effectively. The novel is a very easy read, even though the plot is nicely rich and twisted - which switches to alternative dimension / dream-states at times - it moves at a pretty decent rate of knots and I finished the 464 pages in no time at all. There are also sparks of originality present through-out the story and the fluid, evocative prose seems at times like a cross between young-adult and adult fiction. 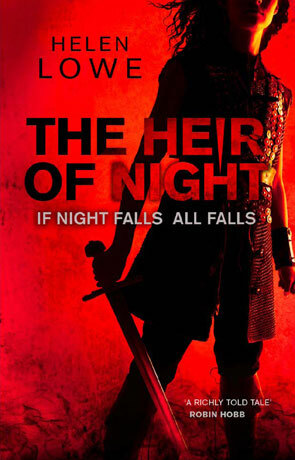 I really did enjoy The Heir of Night immensely, there is a boundless charm and deliciously dark feel to the story that is irresistibly engaging, a must for any fantasy fan. Written on 29th June 2012 by Ant.